Video project for equality: “Tolerant? That’s us” | Rosalie & Co. According to the results of a recent survey, Germany is among the most LGBT-friendly nations in the world, second only to Spain. That is great news, but also a little surprising. In recent months, the public dialogue in Germany regarding homosexuality and equality has reached a new level of intensity and, unfortunately, some low points. Under the pretext of freedom of opinion, opponents of gay rights were allowed to spread silly arguments against equality that were backward and ignorant in the German media. And even though the majority of Germans are, in fact, tolerant of homosexuality, it doesn’t mean that LGBTQI people aren’t still frequently confronted with prejudices and discrimation. Against this background, out German filmmaker Angelina Maccarone and out writer Carolin Emcke have come up with a way to turn the tables. In three video clips, they address common prejudices regarding coming out, family values and visibility. They ask what tolerance really means, who “they” and who “us” is, and how private love can be, how public it maybe has to be. The clips aren’t supposed to lecture viewers, but make them laugh, hopefully about their own resentments. The clips are available online, but it is also planned to show them in various movie theaters around Berlin. Also, each clip comes with subtitles in several different languages. 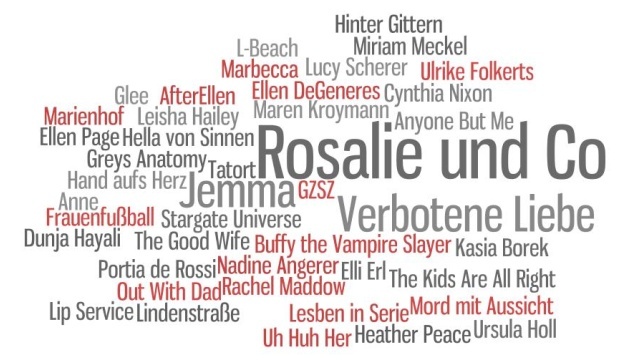 If you know a little about German TV and/or lesbian pop culture, you might see a few familiar faces in the clips, for example, out actress Maren Kroymann and out morning show host Dunja Hayali.